The Gresham baseball team rolled into its second-round contest in the Class 6A playoffs with high hopes. The Gophers came into the game at West Linn as the ninth-ranked team in the state, carrying an 18-10 overall record after finishing third in the Mt. Hood Conference and coming off an impressive 7-0 first-round win over Southridge. The Lions made sure Gresham left in considerably worse shape, handing the Gophers a decisive 11-0 loss that lifted their season record to 21-8 and guaranteed them a berth in the state quarterfinals. West Linn, the Three Rivers League co-champion, will face top-ranked Metro League champion Westview (25-3) at Westview High School at 5 p.m. Friday. "I think it's just going to take coming out and swinging the bats well from the start no matter who we face, whether it's their ace or we face their third guy," said West Linn junior shortstop Jonathan Kelly, who went 2 for 3 with two doubles, one RBI and three runs scored against Gresham. "We've got to come out and hit the ball, and if we can do that, I think we'll be in good shape." 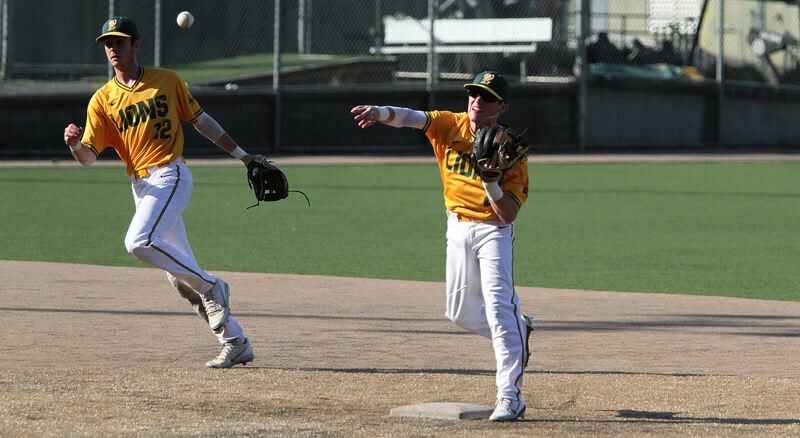 "We've got to play the (top) seed, but to be the best you've got to beat the best," said West Linn senior second baseman James Marshall, who went 2 for 4 with two doubles and two RBIs. "We've got to go on the road there's nothing better than beating somebody at their home place. We're looking forward to it." The Lions were on fire early against Gresham, opening the game with back-to-back doubles by Marshall and Kelly to lead 1-0, then bringing Kelly home on a squeeze bunt by Griffin Banta to make it 2-0. While West Linn loaded the bases after that but failed to score again, it didn't matter on this day. The Lions tacked on four more runs in the second, three in the fourth and two in the sixth to pull away. With the bats alive and Gresham's defense struggling — the Gophers committed five errors in the game — West Linn senior starter Garrett Marioni was in total control. For the game, he threw six innings, allowing three hits and three walks while striking out two before giving way to junior lefty Tate Kadel for a scoreless seventh. "I felt pretty good. It was a little rough at the start of the game, but I came back," he said. "It's really nice having a lead so you don't have as much pressure when you're throwing." In the bottom of the second, the Lions got a two-run double by Marshall, an RBI double by Kelly and their fourth run on an error to lead 6-0. West Linn ran its lead to 9-0 in the fourth, scoring twice on Gresham errors and once on Zach Bell's bases-loaded walk. And in the sixth, Marioni and Bell both hit RBI doubles, the last two of the eight doubles the Lions collected in the contest. After the game, West Linn's players talked about the importance of their fast start. "The biggest thing for our team, I think, was getting that first-inning lead," Kelly said. "If we can get that first-inning lead, the rest of the game we just put it on autopilot, keep grinding and going faster and faster and getting more runs." "We definitely showed up with the bats today and were aggressive on the bases so that was good," Marshall said. "We put a lot of pressure on them early which was good to see." "I think we've been doing great with the bats as a team and we have been putting up a lot of runs which makes the pitchers' jobs easy," Marioni added. For the game, Bell went 2 for 3 with two doubles and one RBI. For Gresham, junior designated hitter Alex Johnson had two of the Gophers' three hits. Sophomore Trevor Bless threw the first two innings for Gresham, then gave way to junior Evan Olson for the next 3 1/3 before senior Alex Wells closed it out. *The original version of this story incorrectly listed West Linn's relief pitcher — it was junior Tate Kadel.